Patriot Oaks Academy PTO is proud to announce ChargerTHON 2018: The Race is On! This year’s fundraiser is run by our PTO, parent volunteers, and school personnel and features a variety of prizes, incentives, and a Fun Run Relay for our elementary students and a Fun Twangled Team game for our middle school students. 10% of all money generated goes to A.S.S.I.S.T., a local non-profit organization that aids local homeless students. In addition, 10% of all money raised by individual classrooms goes directly back to that classroom. All other funding goes to supporting our school as a whole and our students! This year’s goal is to raise $35,000. We have reached this goal for the past three years, so we know we can reach it again! We must meet this goal to give back to A.S.S.I.S.T and individual classrooms. The fundraiser kicks off Friday, October 12th, and concludes on Friday, October 26th. Elementary Fun Run Relay is Friday, October 19th. Each grade will run the relay during their scheduled resource time. Please have your student(s) wear their field trip t-shirts on October 19th. Middle School will participate in Twangled Games on Thursday, October 18th during their scheduled P.E. time. Any parent who would like to come watch/support their child may enter the field through the back gate (located at the far left of the school near Islesbrook Parkway). We will have a table to sign in/out. You must enter and exit through this gate. If you wish to enter the school, you MUST go back to the front office and sign in. Students can raise money from family, friends, and neighbors through flat donations this year. All students will participate in either the Fun Run Relay (ES kids) or Twangled Games (MS kids), regardless of donations raised. All students will have an individual fundraising page through our vendor, 99 Pledges. Visit https://99pledges.com/fund/chargerthon2018 to find your student’s individual pledge page. Share with family, friends, neighbors, and co-workers to help your student raise money. Donations can be made by credit card, cash, or check. Credit card donations need to be made through the student’s individual fundraising page; cash and check donations can be sent in with your student each day during the campaign. Please put cash or check in an envelope labeled “ChargerTHON” with the student’s name and teacher. All monies sent to school must be sent in no later than October 26th in order to receive prizes and to be credited towards the student’s classroom total. 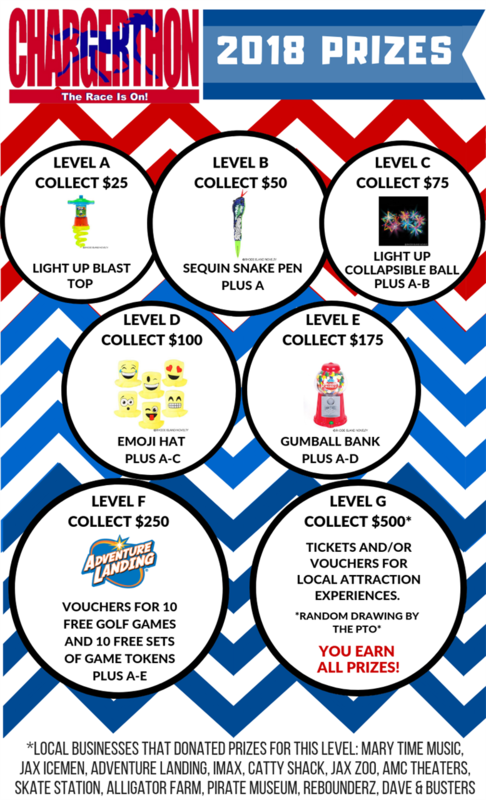 Each prize is earned as a student reaches each level. See the image below for a list of prizes. 1st Place fundraising student will earn 4 tickets to Sea World Orlando! 2nd Place fundraising student will receive 4 tickets to Aquatica Waterpark! 3rd Place fundraising student will receive admission for 2 adults and 2 children to Tree Trek Orlando! The top three classes get a pizza party (total raised/total number of students in homeroom)! The school-wide incentive for reaching our $35,000 goal is an administration scooter race through the school and gym! They will have to paddle fast to win this race!! Thank you for supporting our community school!